This should be a good tutorial to brush up on your drawing skills in photoshop. 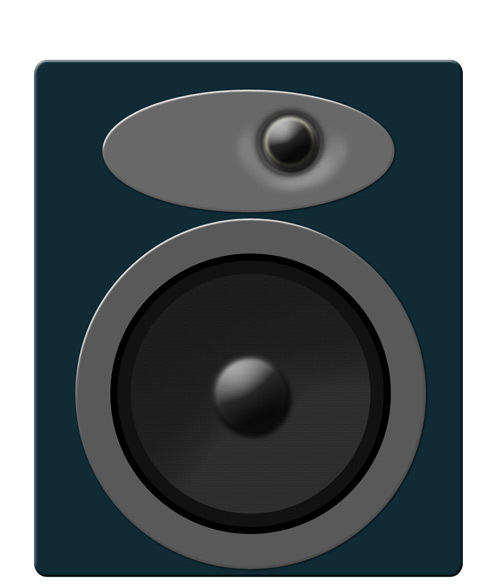 Drawing a speaker is relatively quite easy as I’ll show you in this tutorial. Open a new document, 800x900 pixels and draw the shape in the image above, using the ’rounded rectangle tool’. The color code I used is #102b35. Make this shape using the ’rounded rectangle tool’. The color code is #7a7a7a. Deselect, highlights should look something like the one in the image below. The color code is #747474. Create a new layer, now fill the selection with the color code #393939 and deselect. Stroke the layer with the color code #747474.
bring the selection to the center and fill it with the color code #7a7a7a. Transform(ctrl+t) this duplicate black circle to 80% of its original size. Make a duplicate of the black circle, transform this one to 95% of its size. The pattern I used comes with photoshop, I’ve written down the name so you can find it easily. I hope this tutorial on drawing a speaker in Photoshop was interesting and easy to follow. If there are any questions at all regarding this tutorial please feel free to let me know through comments.